Popular talk series for female entrepreneurs continues on to its next stop in Easthampton, Mass. EASTHAMPTON, Mass. 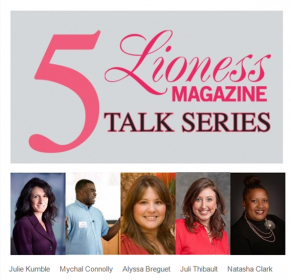 - April 3, 2014 - PRLog -- Lioness Magazine announced the speakers for the publication’s series “5” to take place this month. Lioness has partnered with the Women’s Fund of Western Massachusetts for this month’s event. • To encourage innovation and entrepreneurship in the Pioneer Valley. • To provide a stage for women to share their ideas, expertise and inspiration. • To reinvigorate entrepreneurs who have chosen to headquarter their passions in Western Mass. • To pioneer a safe space for women to address entrepreneurial topics that are relevant to them. Guests pay $10, with lunch included, to enjoy listening to 5 experts in 50 minutes as they speak on a variety of topics pertaining to innovation and entrepreneurship. This month’s event will be held at the Women’s Fund of Western Massachusetts on Friday, April 18th at 12 p.m. The Easthampton 5 speakers are Julie Kumble of the Women's Fund of Western Massachusetts, Mychal Connolly of Stinky Cakes, Alyssa Breguet of Raising Change, Juli Thibault of Baystate Health and Natasha Clark of Lioness Magazine. Tickets are currently on sale and can be purchased online at 5easthampton.eventbrite.com.